Explore celebrations during Navratri festival in United States of America (USA). Navratri in United States of America - Festivals find an important place in the cultural agenda of the Indian diaspora in the U.S. Navratri is one prominent festival which is celebrated gloriously by a vibrant Indo-American population of over 2 million. The celebration of this nine-day-nine-night Hindu festival, dedicated to Maa Durga and her nine manifestations of the cosmic energy, is as much known for its deep religiosity as for its invigorating dance and cultural events. The Sharad Navratri, which marks the onset of winter, has grown very popular in recent times owing to the resplendent decoration, dances and music performances. Besides, it gives people from different communities a great opportunity to blend in and mix socially. Navratri is an important festival celebrated in the United States. 'Navratri' is a festival celebrated to worship the mother divine or feminine energy embodied by Ma Durga. It is literally translated as ‘nine nights’ of devotion. This festival is as much about spirituality and religious connect as it is about celebration through song, music and dance. The latter is the most popular part of the festival in the U.S. as it sees the participation of people from all ages. Though the festival involves rituals of puja and fasting, some choose to do only partial fasting with fruits and ‘vrat’ food or ‘fasting menu’. Big celebration is witnessed in places which have seen visible population growth, the most prominent ones being California, New Jersey and Texas. Navratri festival celebration involves folk dancing and singing and a special procession around various an image or symbolic representation of Hindu goddesses. It attracts people to different venues across the region, with some venues taking prominence. The West Coast Navratri celebration is one of the biggest one. Some people do "japa" or repeated chanting of a mantra dedicated to Goddess Durga. Generally, 100,000 repetitions is considered to be a powerful number of ‘japas’ during Durga Puja. One of the most essential custom is to dance around the ‘garbha’ which symbolizes the Goddess and is lit by diyas. As part of an enduring tradition, participants give in to the rhythmic motions of the folk dances, such as 'Garba' and 'Raas' and their numerous variations. The dance honours the nine manifestations of Maa Durga. Puja at homes is done in a traditional manner. 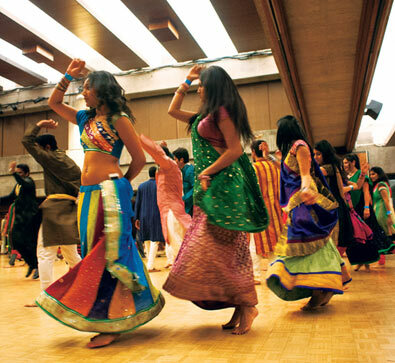 However, the Garba and Dandiya events take on a more contemporary flare owing to the flexibility of the dance forms. Traditional and authentic Indian food adds to the festivities. Dandiya is organized at a very large scale with several performances from artists. Performances by leading folk music bands or groups from Gujarat and Mumbai are also the headlining part of the event. The music ranges from the folksy to the contemporary. ‘Raas’ and ‘Garba’ being formats that lend themselves to individuals and group-level competitions, create a strong level of interest and excitement among the participants. Simple steps like hand clapping and swaying movements with the rumbustious ‘dandiya’ or bamboo stick movements have evolved to include variations that are complex as well as freestyle. Some have developed into the realm of fusion dance such as incorporating some basic salsa steps to match high-energy beats. The events keep getting bigger every year, as more attendees make their way to the events. Interestingly Navratri has gained mainstream status in Southern California even as non-south Asians are seen joining these celebrations in huge numbers. Indeed, the beauty of the dance events lies in its traditional roots and lack of age, community or race distinctions. The nine nights are an opportunity for the participants to soak in the deep ethnic vivacity of Hindu traditions. ISSO Swaminarayan Temple and the Anaheim Center are important venues. In some places, the event is ticketed for a social or charitable cause. Some student bodies also hold university level programmes that support community building. On another level Navratri has acquired a different meaning in the cultural context. People from diverse backgrounds find a common link to partake in the colourful events that celebrate life and its primeval source. While the festival also strengthens community values it also encourages a close understanding of Indian traditions.